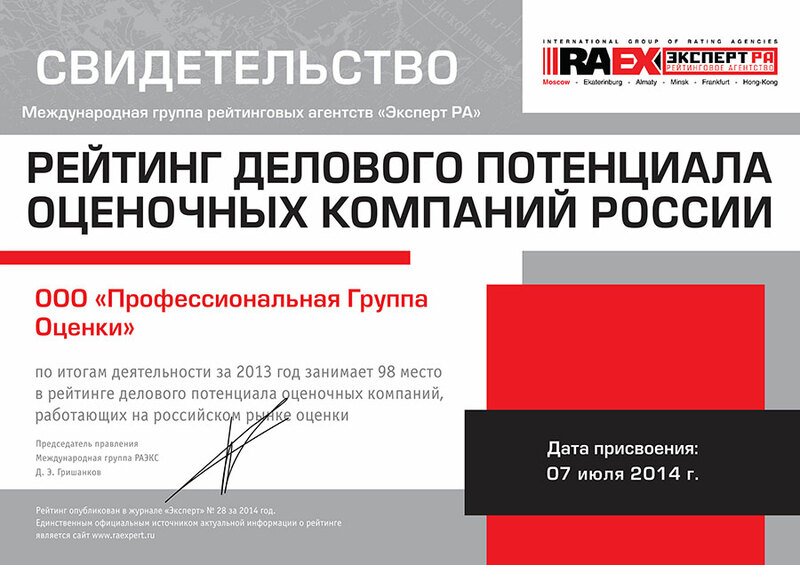 Professional Group of Appraisal LLC is in TOP 100 of large Russian valuers. Expert RA International Group of Rating Agencies conducted a study of the valuation services market for the purposes of business potential of the valuers. A complex rating was performed within the frameworks of the study which enabled to identify those valuers who enjoy the highest business potential of their valuation services. Based on the study results, the rating of the valuers was composed as well as the list of the largest valuers (by volume of revenue) and also leaders in the market were identified. 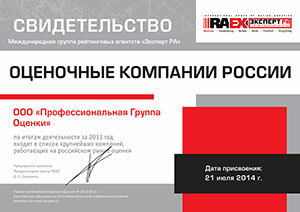 Our Firm regard its involvement in the rating as a unique chance of joining the Top 100 of Russian large valuers, and thus it helped achieve its reliable image and good business repute. Based on the results of our ranking in the rating of Expert RA, Professional Group of Appraisal LLC obtained a certificate that confirms that the Firm is the 98th in the business potential rating and 64th in the list of large valuers. For the unabridged version of the Table refer to the web-site of Expert RA Rating Agency (www.raexpert.ru). Professional Group of Appraisal LLC submitted its financial statements for the purposes of confirmation of its revenue. 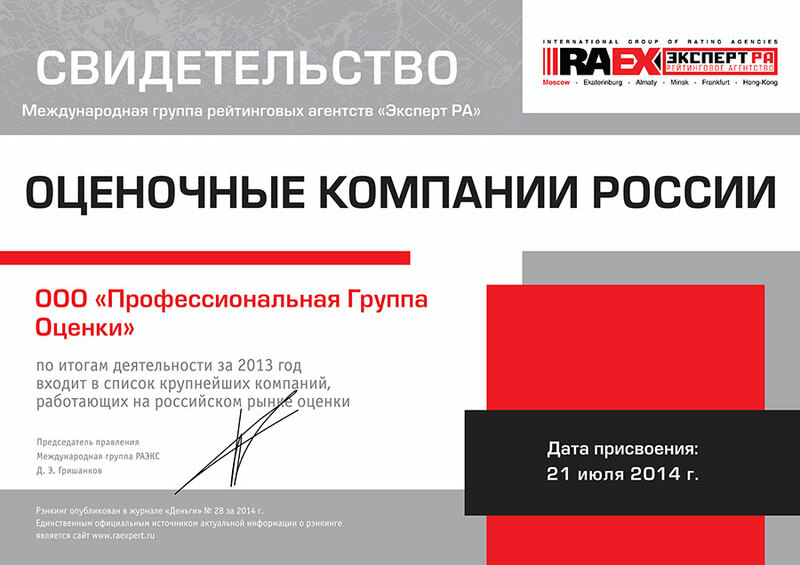 The study results are placed on the web-site of Expert RA, published in the Expert journal and in the Dengi journal (Kommersant Publishing House). 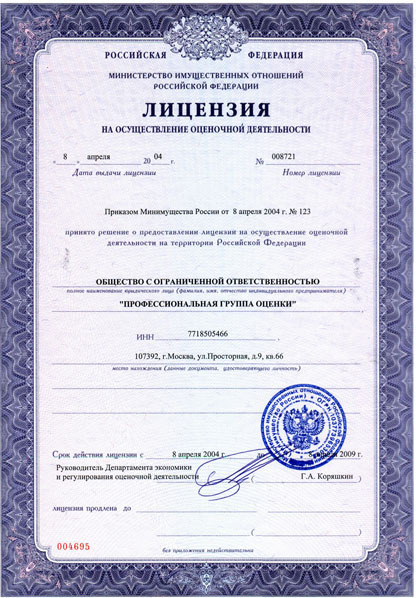 Information in interest is published by the specialized mass media: Auditor journal, web-site of the expert journal, web portal Valuer.Ru, popular business web-site of RIA RosBusinessConsulting, IA Finmarket.